This column first ran in The Tablet in February, 2009; we ran it here for the first time in 2016. Under the dim light of a distant sun, a cold white ball smaller than our Moon orbits a huge gas planet, garishly striped with colored clouds. Galileo first saw this jovian moon – to be named “Europa” by his rival, Simon Marius – on January 7, 1610. In 1805, Laplace had worked out Europa’s mass (using an elaborate theory of the moons’ orbits), and other 19th century astronomers timed the way the Jupiter moons shadowed each other to estimate their sizes. By the end of that century clever instruments allowed Pickering to estimate its brightness. All the information was there. From these data, any schoolchild could have calculated that Europa was less dense than rock, more dense than ice, and brilliantly white. But no one actually put all that information together until 1908, when Pickering finally noted the low density and bright surface... and speculated that this Jupiter moon was a ball of white sand! The first published description of it as an icy body came in the 1923. Jeffreys was arguing that the giant planets Jupiter and Saturn must be rich in ice, and noted in passing that this was supported by the obvious icy nature of their moons. Obvious; but no one had ever actually said so before. My real passion then was not science, but science fiction. I imagined a world where intelligent tuna swam between a rocky floor and an icy ceiling, never knowing that there was a whole universe of planets and galaxies over their heads… until the day a colliding asteroid poked a hole through the crust and sent my dolphin hero flying out to discover: it was full of stars! Indeed, similar moons (as yet undiscovered) around the giant planets already detected orbiting hundreds of nearby stars may have similar environments, similar havens for life. A few years after my thesis was published, the first NASA spacecraft flew past Europa. Snapshots taken then, and during subsequent fast flybys, have shown that that surface of Europa is covered with fractured ice like the sheets over the arctic oceans, and Europa deflects Jupiter’s magnetic field the way you’d expect if it contained a salty, electrically conducting ocean. My thesis wasn’t completely crazy. But is there life inside Europa? As of yet, we don’t even know for sure if the ocean is really there, or how thick the crust is between it (should it exist) and the surface. [Actually, the interaction of Europa with Jupiter's magnetic field is pretty strong evidence that there is salty liquid water below its crust. 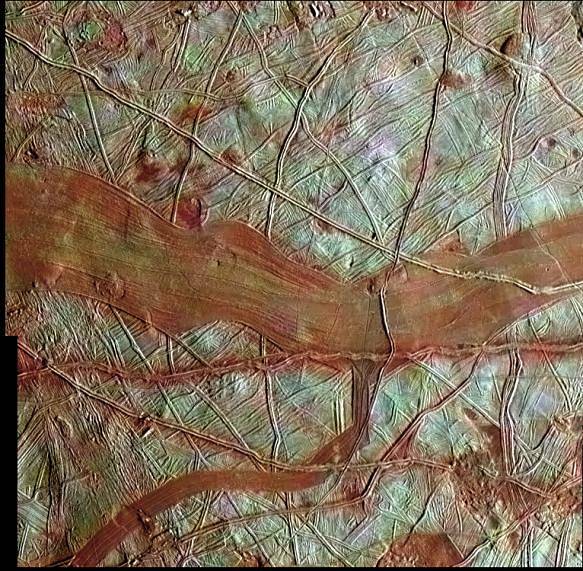 And some evidence of water appearing intermittently above Europa was also found in 2013. But we haven't seen the kinds of plumes that have been spotted over the surface of Enceladus.] We don’t know enough about Europa to know how to go about looking for life. And so, [in February, 2009] NASA and ESA announced plans for a three billion dollar mission to orbit Europa. Its job is to find out what we need to know, to find out what we want to know. Will my dream be confirmed? The proposed mission won’t launch until 2020, and won’t orbit Europa until 2028... more than 50 years after I wrote my thesis. Should I still be around, I’ll be 75 years old by then. Any follow up mission to drill through the crust and look for my dolphins, probably won’t happen before I reach 100. Meanwhile, I’ll just have to dream.